Cardiogenic shock can arise from several causes including arrhythmias, myocardial failure, valvular, defects, septal defects, pulmonary hypertension, myocarditis, and myocardiopathies. Of all the forms of shock, it can be the most resistant to treatment. If the heart cannot pump, there may be nothing that can be done. On the other hand, in less severe cases, it is possible to improve the efficiency of the pumping capability that remains. The diagnosis of cardiogenic shock usually depends on recognizing an underlying medical condition predisposing the heart to dysfunction in conjunction with an abnormal ECG. The shock is frequently associated with distended neck veins, unless the patient also happens to be hypovolemic, as in a bleeding patient with a recent myocardial infarction. It can also be associated with peripheral edema, an enlarged and tender liver, an enlarged heart on physical examination or x-ray, a third heart sound, rales or x-ray evidence of pulmonary edema, electrocardiographic signs of ischemia. The diagnosis is usually easy, but two common situations may pose a problem. The second is to ascribe shock to myocardial contusion in a patient who has just suffered a blunt injury to the chest. Although blunt chest trauma can damage the heart, the damage is usually either fatal, with death at the scene of the injury, or, far more often, of no clinical significance. A contusion that produces failure but not death is rare. Too-rapid heart rates also have to be treated, especially if the contractions are dyscoordinated. Short times during diastole limit filling of the ventricles and limit the time for perfusion of the myocardium. The upper limits of the heart rate depend on the patient’s age, underlying cardiac status. In a subject with no underlying cardiac disease, the heart rate should not exceed 0.8 multiplied by 220 minus the patient’s age in years. In a patient with a compromised heart, a heart rate that exceeds 100 may be too rapid. In some cases the rate might be sinus in origin, but in life-threatening cases, the rapid rates are usually associated with arrhythmias. Treatment of these arrhythmias should follow the guidelines described by Ursic and Harken. The approach depends on the hemodynamic effects of the arrhythmia. Moribund patients should be cardioverted. If the patient is near death, the treatment is shock. One hundred joules should be used initially. If unsuccessful, the energy should be rapidly escalated to 360 J.
Cardioversion will be of no value in patients in asystole or with a fine ventricular fibrillation, but successful resuscitation to full neurologic functioning of patients with these arrhythmias is rare. The goal is to get the heart pumping effectively as quickly as possible in those patients who have some hope for recovery, such as those with coarse ventricular fibrillation, tachycardia, and supraventricular arrhythmias with unsustainably rapid ventricular responses. Cardioversion can be successful in all of these cases. The nonmoribund patient with a tachyarrhythmia associated with abnormal ventricular conduction should also be cardioverted. If the tachyarrhythmia is associated with normal ventricular conduction—that is, if the patient has a supraventricular tachycardia—the treatment is calcium-channel blockade. Verapamil is a good choice, in an initial dose of 10 mg, followed as needed with a drip at 1 mg/min until the rate slows. In summary, all critical patients with a tachyarrhythmia should be cardioverted, with the exception of the more stable patient with a supraventricular tachycardia, who should receive a calcium-channel blocker. The simplicity of this approach translates into the possibility of rapid reestablishment of normal blood flow, which cannot be achieved with chest compressions but which can be achieved with a beating heart. The result of quickly reestablishing a beating heart can be a patient who survives with intact neurologic function. This approach will suffice as initial treatment for all of the potentially salvageable life-threatening arrhythmias in the surgical patient, but treatment becomes more complicated once the original arrhythmia has been dealt with. This topic — maintenance of an acceptable rhythm after initial resuscitation — has to be left to other textbooks. Diuretics are the keystone of therapy in congestive heart failure with large ventricular end-diastolic volumes. By decreasing vascular volume, diuretics decrease atrial pressures and mobilize peripheral edema. Pulmonary vascular pressures and volumes decrease; effectiveness of right ventricular contraction increases. Coronary blood flow increases as coronary sinus pressure drops. Decreasing pressures in the ventricles during diastole alleviates compression of the coronary vasculature in the endocardium, when the ventricular muscle receives its nutrient blood flow. 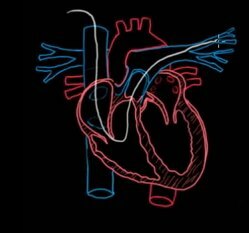 And decreasing pressures in the right atrium decreases the stiffness of the coronary vasculature, which decreases the stiffness of the ventricles during diastole (the garden hose effect). The ventricular end-diastolic volumes potentially can increase without much of an associated increase in the end-diastolic pressures. Almost all patients in cardiac failure with ischemia, rapid heart rate will benefit from a beta-adrenergic blocking agent (eg, esmolol or metoprolol). Decreasing the rate and reducing ventricular stiffness during systole decreases myocardial oxygen requirements. Increasing time in diastole and decreasing ventricular stiffness during diastole augments ventricular filling and increases efficiency of ventricular contraction. All of these effects reduce myocardial oxygen consumption, potentially salvage marginal myocardium. In many patients, the reduced oxygen requirements can be achieved with only minimal loss of energy output from the ventricles. The only contraindication to the use of beta-blockers, beyond the rare development of bronchospasm with administration of the drugs, is hypotension. This latter problem is easily monitored. Hypertension is unusual but not unheard of in patients with cardiogenic shock. The hypertension is usually associated with inefficient delivery of energy into the aortic root. Treatment should begin with opioids, if the patient is in pain, and then diuresis, if the ventricular end-diastolic volumes are large, and then beta-blockade, if the heart rate is rapid. Vasodilation is the next step. The most useful vasodilators in surgical patients with cardiac failure are morphine, nitroprusside, and nitroglycerin, all of which are either easily reversible or short-acting. All of these agents dilate the systemic arterioles; nitroglycerin and morphine also dilate the systemic venules, small veins. The drugs can have many beneficial effects. Edema can be mobilized. Atrial and ventricular diastolic volumes and pressures can be decreased. Perfusion of the myocardium can be increased. Myocardial work and oxygen consumption can decrease. Ischemia can be reversed. On the other hand, excessive venous dilation can decrease cardiac filling enough so that stroke volumes and blood pressures fall; excessive arteriolar dilation can make the pressure fall further. Inotropic agents, such as dobutamine (milrinone), can increase cardiac output in patients in cardiogenic shock, but not all. The agents will usually not increase the pressure. They almost always result in increased myocardial oxygen requirements, and the patients receiving the drugs need to be monitored in an ICU. Development of chest pain or ischemic changes in the electrocardiogram suggests that oxygen demand is exceeding supply. If it is necessary to use inotropic agents for more than 1 hour, a Swan-Ganz catheter should be inserted. Systemic arterial pressures, atrial filling pressures, cardiac outputs should be determined at different infusion rates. If any question remains about the adequacy of volume resuscitation, cardiovascular parameters should be measured before and after a fluid bolus is given. Digitalis compounds should not be used in acute cardiac failure except to control ventricular rates with supraventricular tachydysrhythmias. Toxicity may develop, especially when pH and electrolyte changes are unpredictable. The inotropic actions of digitalis are no different from those of dopamine and milrinone. Patients in cardiac failure with a heart rate in the 60s may on a rare occasion temporarily benefit from administration of a chronotropic agent, such as dopamine. (Isoproterenol is almost never used nowadays.) If dopamine is to be used, the heart rate should only be increased to levels that can be tolerated comfortably. A patient with normal coronary arteries gains little with a heart rate that exceeds 120/min; the limit is about 90/min in the presence of coronary artery disease. In most cases, however, the price to be paid for using a chronotropic agent exceeds the potential benefit. Chronotropic agents increase myocardial work and oxygen requirements and shorten the time during diastole for coronary blood flow, ventricular filling. Vasoconstrictors are occasionally useful to increase perfusion pressures for a heart supplied by arteries that are blocked proximally by pathologic processes. On the negative side, the constrictors will increase myocardial oxygen requirements. To be effective, the vasoconstrictors have to increase the aortic pressure enough so that the increased perfusion of the myocardium makes up for the increase in the myocardial oxygen requirements. Vasoconstrictor use can result in necrosis of organs in the periphery, like the extremities or the gut. They will not increase perfusion to the brain, assuming that the carotid arteries are open and that the patient has a functioning adrenergic nervous system. The endogenous adrenergic nervous system is ideally suited for ensuring adequate brain blood flow. The baroreceptors are not placed in the carotid bifurcations by accident. It is most often used in conditions in which one can expect cardiac function to recover within a matter of a few days. Bleeding complications make it impractical for periods exceeding that time. Although listed last, an operation is sometimes the best early approach. Ruptured valves, occluded arteries, aneurysmal ventricular walls, and certain arrhythmias can potentially be returned to normal with a surgical approach. A surgical solution should not always be the last to be tried. Persisting with a nonsurgical approach can convert a potentially curable problem into one that is hopeless.